What do you do if you buy a new car but don’t have a garage or carport to protect it? You get a new carport designed and built by Mr Carports. 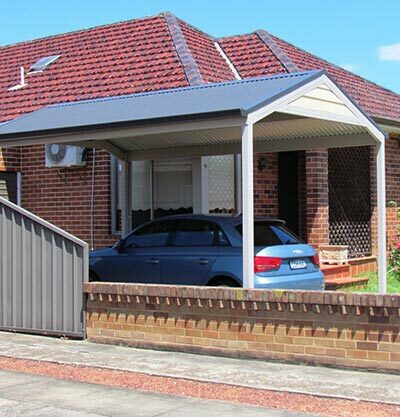 Which is exactly what the owners of this new Sydney single carport did. The homeowners, in the Sydney suburb of St George, had bought a new car but no structure to protect their new asset. When Mr Carport met the homeowners to discuss the Sydney single carport project the main need was for a low maintenance carport. They didn’t want to be painting posts or structural beams and wanted a carport that would virtually take care of itself, aside from perhaps plucking the odd leaf out of the gutters. With low-maintenance a key, a metal carport was chosen. Choosing steel for the posts and frame of a carport can sometimes cost a little more than timber but it does come with benefits. Most notably, steel won’t rot, warp or twist and it’s very strong. And, of course, it’s low maintenance. To complete the project and fit the low maintenance bill, a Colorbond roof and metal gutters were chosen. Small end infills were also installed to add a touch of character to the Sydney single carport. Protection for the new car? Tick. Low maintenance? Double tick! Whether you’re considering building a low maintenance single carport or something larger and grander for your home, take a look at our Sydney branch page or the Outside Concepts carports page for more information on building a carport in Sydney.